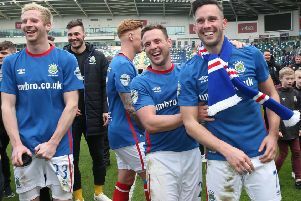 Linfield’s impressive away form continued thanks to an Andy Waterworth winner at Mourneview Park. A drab first half was devoid of many real chances, incidents or real talking points. Linfield could have gone in front on 25 minutes when Stephen Lowry held off Glenavon’s Mark Sykes. He fed Waterworth and his low drive along the ground was tipped away for a corner. Three minutes later Mark Haughey could have scored against his old club, but his header from Ross Gaynor’s corner was wide of the mark. On 32 minutes Linfield’s pressure finally paid off. Waterworth fed Aaron Burns, who raced onto the ball inside the box and unleashed an unstoppable shot past Glenavon’s Jonathan Tuffey. Glenavon's Andy McGrory celebrates scoring a penalty against Linfield. With five minutes to the break the visitors could have doubled their lead, but Mark Stafford correctly had a goal ruled out for a handball. The Blues had two great chances as the second half got underway but neither Waterworth or Burns could double the Linfield advantage. As the second half progressed Glenavon began to get on top of their opponents and pulled level on 63 minutes. Andy McGrory chased onto a long ball into the box and as he played a low cross inside the box. Stafford slid and handled the ball. McGrory took the resulting spot kick, putting it down the middle and sending Roy Carroll the wrong way. Just as they were gaining momentum, Glenavon were reduced to 10 men on 67 minutes. Ciaran Martyn received his second yellow card for a late challenge on Gaynor; he had been booked in the first half for an ill timed challenge on Matthew Clarke. And Linfield punished the Lurgan Blues on 76 minutes. Waterworth put David Healy’s men back in front. A Sean Ward shot took a deflection and fell kindly for the striker, who finished with aplomb. Glenavon: Tuffey, Canning, Neill, Lindsay, Marron, Patton, Sykes, McGrory, Martyn, Moorhouse, Bates. Subs: Hamilton, Kelly (Bates 72), Kilmartin (Neill 54), O’Mahoney, Gray (Canning 80). Linfield: Carroll, Haughey, Stafford, Callacher, Waterworth, Lowry, Millar, Burns, Ward, Clarke, Gaynor. Subs: Stewart (Millar 75), Casement, Fallon, Amuneke, Carson.